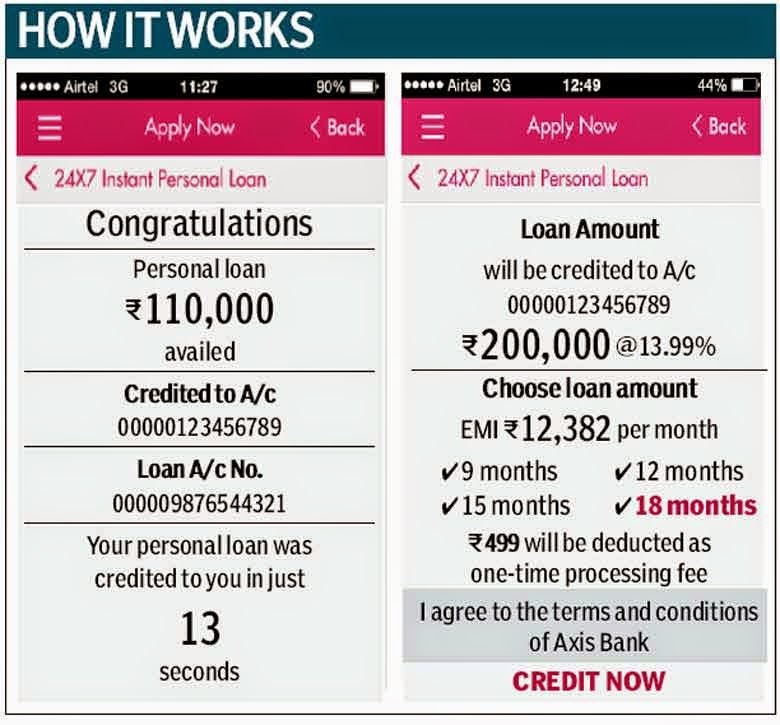 Axis Bank has launched an instant personal loan service called “24X 7 Instant Personal Loan” — available through its mobile app. 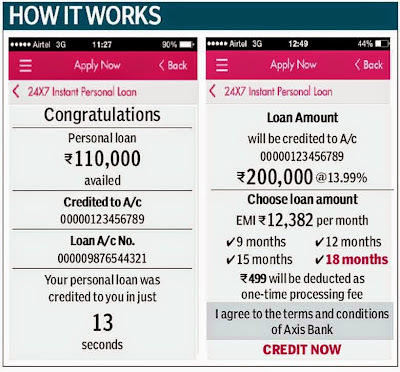 Axis Bank has launched an instant personal loan service called “24X 7 Instant Personal Loan” — available through its mobile app, via which its select customers can avail personal loans that will be credited to their accounts instantly. The paperless service requires a customer to log on to the bank’s app where they can view their pre-approved loan amount. The customer can then decide on the amount they want to avail of, through a slider scale on the app, as well as the loan tenure. After the selection, the app displays the equated monthly instalment (EMI) for the amount, along with the processing fee and the interest rate applicable on the loan amount. Once one agrees to the terms and conditions, the money is instantly credited to the customer’s account and a message is displayed on the phone. According to Axis Bank, there is no verification call for this process. The maximum loan amount a person could avail of varies from customer to customer, depending upon their credit profile. “We keep track of the customer’s records and, based on the latest information, we make the offers on the app and this differs from person to person. We are using the big data technology at the back-end,” said Jairam Sridharan, head of retail lending and payments, Axis Bank. Since the pre-approved amount depends on the latest track record of the customer, it may differ from day to day, he added. On the maximum loan amount that could be disbursed through this service, Sridharan said for the top-end customers, it would be up to Rs 5 lakh. The bank did not disclose what the minimum amount is, but confirmed it will be close to Rs 1 lakh. The interest rate is likely to be in the range of 12-17% for the personal loan, according to Sridharan.